Nissan Sentra. The experts at Westlie Ford have crafted this Ford Focus vs. Nissan Sentra comparison article to provide you with all the information you need to make a decision on which sedan best suits your driving needs. 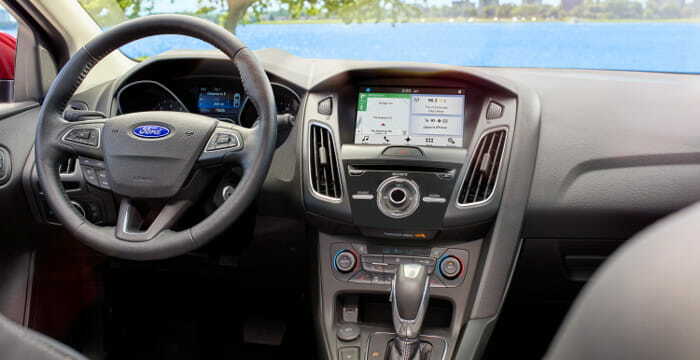 For a detailed breakdown of information on the Ford Focus, be sure to check out the Ford Focus research hub. If you already know that the 2018 Ford Focus is the sedan for you, peruse our extensive Focus inventory to view available models. If you have any questions, or would prefer to speak directly with a product specialist, call (360) 602-2490. For the purposes of this comparison, we will be looking at the 2018 Ford Focus S sedan, starting at $17,950 MSRP, and the 2018 Nissan Sentra S, starting at $16,990 MSRP. 146 lb.-ft. Torque 125 lb.-ft.
After closely comparing the 2018 Ford Focus to the Nissan Sentra, our product specialists believe the Ford Focus is the clear winner, packed with premium comfort, convenience, and technology features to upgrade your daily drive. The best way to decide if the 2018 Ford Focus is the ideal sedan for your lifestyle is to schedule a test drive appointment at our Ford dealership in Washougal, WA! If you have any questions, contact us online or give our team a call at (360) 602-2490.